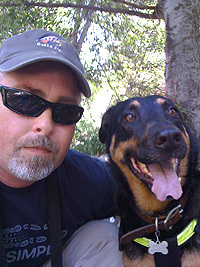 Building the best dog leashes for your Big Dogs. Hiking with dogs is always an adventure, it’s what we do. Urban streets, backcountry trails, mountains and the deserts, we enjoy it all. Building custom dog leashes was never part of my life long goals, it was never a thought. Most of us just assume that our dogs are secure on the end of most any leash we purchase, I did, and that is until the leashes I purchased from a major pet store failed. This allowed my overly excited dogs to take chase after a coyote that led them off into the forest, not so fun. One of the simplest and basic items your dog requires is a well made rope leash. The best trained dogs especially dogs with high prey drives can completely ignore any recall command and behave like they have no idea who you are, or what your saying. You don’t want your dogs getting off leash especially in an area they are not familiar with or one that may be dangerous. After spending hours tracking my dogs in unfamiliar territory and all of us wet and muddy; the situation was not looking good. The sun was going down and the night would be freezing, my anxiety level started to skyrocket. The idea of spending the night in the wet forest seemed inevitable and miserable; starting a camp fire in the wet forest would be next to impossible. A dogs leash is often underappreciated and not until it fails do we see its importance in keeping our dogs safely at our side. Pet stores rarely sell leashes that use quality materials and never mention specifications like weight limits or safe working loads. I set out to build rope dog leashes using the same quality materials I use and trust when rock & mountain climbing as well as hardware I’ve used in sailing and diving. The reasons are simple; the hardware is built to higher standards than similar styled hardware targeted towards the pet industry. The pet industry does not have good quality control. They have no breaking load or strength standards for dog leashes, harnesses or collars. The use of CE rated Climbing Rope, Carabiners or Marine Grade 316 Stainless Steel Clips and Customized Industrial Strength Rope Connections are designed for industries requiring quality, consistency and specific load and breaking strength. These requirements are not found in the pet industry; this makes these parts perfect for use in the custom dog leashes I build. A dogs leash is its lifeline between you and harm’s way. People want a better than average leash for their big dogs. Responsible pet owners understand the importance of maintaining control of their dog. They know the possibility exists that dogs can have high prey drives, switch to fight or flight mode in an instant, get scared or overly aggressive; maybe the dog just decided catching that squirrel was on the day’s agenda, and with a sudden lunge into the leash, the dog breaks free. Dogs are family and deserve the best. A quality leash is essential, and one of the few pieces of gear your dog absolutely must have. My dogs eventually gave up on their chase and safely found their way back to me in the dark. Two of the three of us seemed to enjoy being wet, muddy and having a retched odorous smell. I happily tolerated it. Days later these still smelly dogs had new dog leashes and we stepped up our recall training just for good measure. Years later I decided to offer the same rope leashes for sale and very happy to build these for my customers and their awesome dogs. A Veteran Owned Business Supporting No Kill Animal Shelters & Wolf Conservation.